Over 100 local residents and officials celebrated the commissioning of Silicon Ranch’s 3.9MW solar facility in rural Chickasaw County, Mississippi. Executives from the Silicon Ranch Corporation, State Public Service Commissioner Brandon Presley, Houston Mayor Stacey Parker, and representatives from Tennessee Valley Authority, Natchez Trace EPA, Three Rivers Planning and Development District, Senator Roger Wicker’s office, Congressman Trent Kelley’s office and over a dozen other local and state officials were on hand to help celebrate. 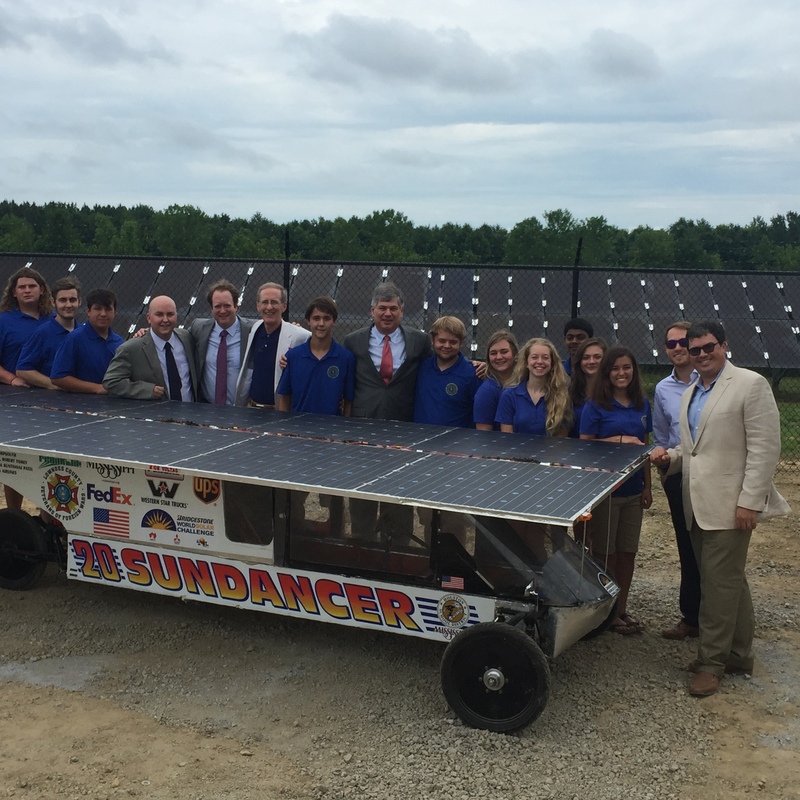 Special guests at the ceremony included Houston High School’s Sundance solar car team. It is one of the most accomplished solar race teams in the US and recently competed in the Bridgestone World Solar Challenge in Australia, where the team’s solar car traveled over 1,500 miles and finished first in its class. The team is pictured above with team members from Silicon Ranch Corporation and MuniStrategies. Silicon Ranch Corporation today announced that the solar farm it began building early this year will soon be generating cost-effective, renewable energy in Chickasaw County. Once final testing is complete next month, the solar farm will generate 3.9 megawatts (MW), enough carbon-free electricity to help power more than 400 homes and businesses. The solar farm is located approximately two miles north of downtown Houston on the west side of County Road 116. The project is part of TVA’s Renewable Standard Offer (RSO) program, a targeted program created to promote cost-competitive renewable energy while serving as a recruitment tool for new industry in the Valley region, retaining and adding investment and jobs. Silicon Ranch, who is the largest developer, owner, and operator of solar facilities based in the TVA service area, invested in the local community and worked closely with the Three Rivers Planning & Development District, MuniStrategies, local officials and landowners, TVA, First Commercial Bank, and the Natchez Trace Electric Power Association to make the project a reality. Silicon Ranch’s construction contractor, LightWave Solar, used approximately 75 workers, over half of whom were hired locally, to install more than 26,000 solar panels. The thin-film panels were locally produced by Stion, Inc., at its manufacturing facility in Hattiesburg, Mississippi making this facility the first of its kind in Mississippi to be completely financed and sourced by Mississippi companies. The parties held a dedication ceremony at the solar farm on Tuesday, June 28. In attendance were Houston Mayor Stacey Parker, Public Service Commissioner Brandon Presley, State officials, City of Houston and Chickasaw County officials, and representatives from the project team. The facility is scheduled to be fully operational by mid-July.